Meet Seth and his Mom, Lori. Seth has been fighting the progressive genetic disease of Duchenne Muscular Dystrophy since his diagnosis at the tender age of 3 years. 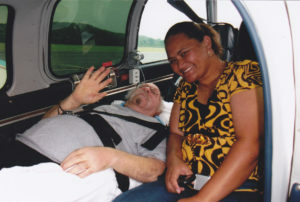 Lori has been his caretaker and cheerleader for his entire life. Seth is a vibrant engaging teenager with a quick wit and contagious sense of humor. The courage of this Mother/Son team is hard to miss. 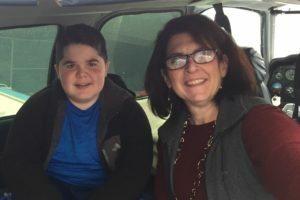 Lori explained that the form of muscular dystrophy that Seth inherited is very rare and there are only a few treatment centers in the United States. That’s why the family had to relocate to Lynchburg, VA, to be closer to treatment for Seth. Pilot Rick Moss and Mission Assistant Peggy Doyle flew this courageous duo to Cincinnati Children’s Hospital on October 23, 2017 for Seth’s regular treatments. They were delivered back home by pilots Mike Pearson and Bob McCamish. 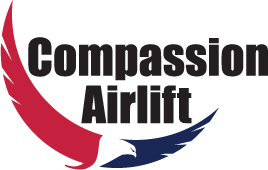 In July 2017, Compassion Airlift transported an 18-year old with Duchenne Muscular Dystrophy, from Shirley, New York on Long Island, to Martinsville, Virginia. His mother accompanied him on the flight. 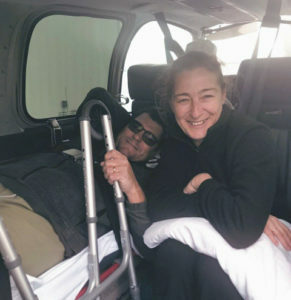 In lieu of a $20,000 air ambulance, a painful 12-hour car ride would have been the only option for transporting this young man if our stretcher equipped Bonanza had not been available. 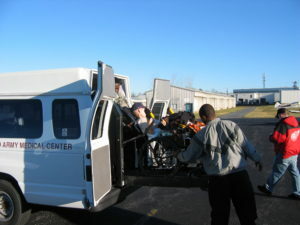 The city of Shirley furnished the ambulance transport to the airport. There was an ambulance standing by for the ground transport as we arrived in Martinsville. Transported a 62-year old woman with Ehlers Danlos Syndrome from College Park to Richmond. Special clearances are required for a pilot to fly into the College Park airport, including a FBI background investigation. Transported a 67-year old military veteran with pancreatitis from Franklin, NC, to Baltimore, MD, for hernia surgery. He also has hearing loss and neuropathy of legs. We transported him back to North Carolina after the surgery. Transported a 58-year old man recovering from a stroke and on oxygen. We transported he and his wife from Norfolk, VA to their home in Sevierville, TN. Transported a 17-year old man recovering from bile duct and gallbladder injury. We transported him from Pittsburgh, PA, to Charleston, WV. 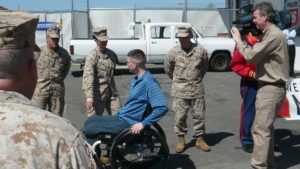 Orange County, VA to Ocean County, NJ, en route to Boston Shriners Hospital. Kaylee is a 6-year old girl with severe burns over her entire body. Discussion with her father revealed that she was not burned externally in a fire, but rather the burned flesh resulted from a chemical imbalance within her body. Despite her burns, she was a lively, sharp, alert, and delightful little girl with a winning smile. 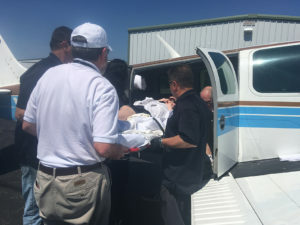 She has made over ten trips with Angel Flight for specialized treatment at the Burn Center at Boston Shriner’s Hospital, and expects to make many more trips. Transported a 27-year old woman with sacral chordoma from Baltimore to Boston. Laverne asked that her non-ambulatory 37-year old daughter be transported from a medical facility in Dayton, OH to a facility near her home in Allentown, PA. We were able to provide the service on October 26, 2015. Laverne was thrilled that we were able to help her daughter. The alternative would have been an eight-hour ambulance transport. Her daughter, mother of a 5- and a 12- year old, was declared to be brain dead after a terrible automobile accident five years ago. She has defied the doctors and is living without life-support assistance. Laverne and her grandchildren are hopeful that Aesha will recover so that she can again be with her family.